March already!!!!! Almost Spring!!! I can't wait. My favorite season...birds, flowers, sun, fresh air, outside!!! YEA!! Okay, now that I got that all out here's the newsletter...enjoy! Before we get to the news there is something I want to mention. You will hear about it often from me but please, just bear with me. RoseBud Reservation....What does this mean to you? A beautiful culture? Fry bread and corn soup? Powwows....dancing....drumming....singing? Well it is a lot more than that. 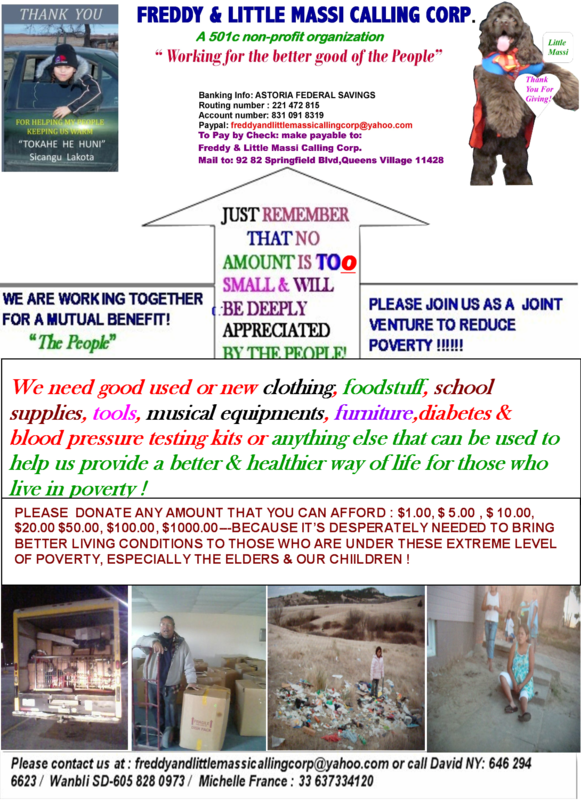 Out of this dire condition a non profit group was started...Little Freddy and Massi Calling Corp. This group has managed, through donations, to supply 15 families in the last eight weeks,with fuel for heat. They supply food, clothes and other things they need to survive. We are asking everyone to dig really deep in their pockets and give!! Give whatever you can even if its just a dollar. A little bit added to another little bit adds up to a lot of help. Think about what they don't have and then think about what you can give up for a day or two...coffee out...donuts out...a new hat...bring your lunch to work instead of going to a restaurant. I am sure if you look into your heart you can find something to give to help these people, our original people, and their families. Most of us don't think twice about donating to one of these causes to help in foreign countries. What about here at home? The conditions some of the people that live on reservations are WORSE than the countries you are donating to. Right here in the United States. "We are all created equally, but grew into who we are today. better place for us and for others. Some of us will, but more of us will not. Freddy and Little Massi Calling Corp. 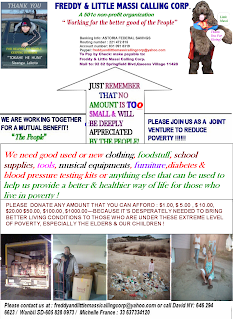 They are also taking donations of hand made items and brand new items to sell on their site as a fund raiser to buy the things they need. You can also check out and see if there is something you might be interested in buying as a gift or for yourself. If you are handy and love making items please make some for Little Freddy and Massi. Thank you so very much from the bottom of our hearts. Please, lets not leave them behind. You can also join in this way and have some fun while you are at it!! Sunday Rez Drive every Sunday afternoon 1pm Central time. Call in, we would love to hear from you. Guests can call in at: (646) 727-1737 Lets hang out together. Lots of interesting information on this program. Please feel free to listen and call in! Lets speak about it with our international panel of down to earth people. Lots of interesting information on this program. Please feel free to listen and call in! Its about entertainment, issues, meeting new friends and Little Freddy!! Guest call in number: 646 727 1737 and join in or listen in if you do not have access to a computer. There is a new group site you can join and keep up with what’s happening. http://groups.yahoo.com/group/freddyandlittlemassicallingcorpThank you once again and please, check with us often, we will be waiting. The Sierra Star has done an excellent job in bringing the shameful acts of dissenrollments of members of the Chukchansi Indians to the public. Congratulations to reporter Carmen George for her McClatchy President's Award for her story on Chukchansi tribal member dissenrollments. Good governance requires fair legal frameworks that are enforced impartially. It also requires full protection of human rights. Impartial enforcement of laws requires an independent judiciary and an impartial and incorruptible police force. That simply is not what is happening on tribal reservations. On reservations across our state tribes are using fear tactics and yes, terrorism, to keep members in line for fear of losing their land, homes, per capita shares and health benefits. More critical is that they also lose their rights to choose a representative government and to vote on issues that pertain to them. Imagine if the Republicans were able to eliminate 25% of the Democratic vote? Currently at Pechanga, the tribal council is threatening allottees with fines, banishment and restricted access to their property. One family is taking it upon themselves to try to force another family who was given an allotment with the creation of the reservation, off their land. They're using their family members on the council to issue the threatening letter that is published on Original Pechanga's Blog. This is not what we voted for when we approved gaming to tribes in our state. This was not what was meant by self-reliance. I urge the readers to stand up for civil and human rights. Bill Cosby stood up and refused to perform at Chukchansi because of these issues. By telling tribes you won't go to their casinos, you can nudge them into acting justly. Don't let tribes get away with terrorizing their own people into silence. I would advise people to consider not supporting casinos owned by tribes that abuse their people. -- Rick Cuevas is a terminated member of the Pechanga Band of Luiseno Indians and writes for Original Pechanga -- originalpechanga.com The site shines light on civil and human rights abuses to American Indians by casino tribes. Original Pechanga's Blog is visited regularly the Bureau of Indian Affairs, House of Representatives, Senate and tribal officials. Students from the Makah Nation in Washington are among 12 finalists for the Samsung’s Solve for Tomorrow contest. The team from Neah Bay High School and Markishtum Middle School made a documentary about the use of mushrooms to clean up Tatoosh Island, a sacred site. The students' video makes use of the Makah language. The team already received $70,000 in technology and software for their schools. If they are among five grand prize winners, they will get an additional $100,000. Public voting for the contest closes at 11:59 p.m. ET on Monday, March 12. The National Commission on Indian Trust Administration and Reform met for the first time today and Interior Secretary Ken Salazar urged its members to work quickly. The commission was created by the $3.4 billion settlement to the Indian trust fund lawsuit. Its members will evaluate trust reform efforts at the Interior Department and deliver a report within two years. However, Salazar said two years is too long to wait. He noted that appeals have already delayed distribution of the settlement, which was approved by Congress in December 2010. "I'm a little concerned about the time frame," Salazar said this morning in Washington, D.C.
"I frankly don't know what's going to happen in November," he said, referring to the presidential election later this year. "If we can get it done sooner, then let's get it done sooner," Salazar told members of the commission. The commission is meeting today and tomorrow. Future meetings are in the works between March and December of this year. "We know that there's been decades of work in trust reform," observed Fawn Sharp, the president of the Quinault Nation of Washington who serves as chair of the commission. Grandfather, do you know me? The son of your son. I come to ask you a question Grandfather. Grandfather, don't you know me? Can I stop being Indian now? I should be able to stop from something? Grandfather, I don't look like you. I don't know what you know. It would be easy for me to hide behind my paler skin. Or see the tears I cry for your Great Grandchildren. Grandfather, look what I have done to our world. The Snake and Owl rule the day. I don't understand the language you speak Grandfather. Grandfather, I want my Pepsi, Levi's and Porsche too. And see the things they see too. I don't have time to dance in the old way Grandfather. Grandfather, why are you crying? "Why doesn’t the tribe just buy land like anyone else and build homes on it without making it part of the reservation?" It’s a good question. It’s also one we’re happy to answer because it allows us to share our history and the essence of being a tribal member. It’s crucial to us for our tribal families to live on land that’s under the jurisdiction of our tribal government. The generations before us endured so much so we can stay together as a people." The Bureau of Indian Affairs has agreed to mediate a leadership dispute within the Picayune Rancheria of the Chukchansi Indians in California. Two factions, one led by Morris Reid and the other by Reggie Lewis, clashed violently at tribal headquarters on Tuesday. Both groups vacated the building on Wednesday after Madera County Sheriff John Anderson negotiated a 48-hour cooling off period. County deputies are now patrolling the headquarters to keep the peace. It's not clear what will happen next but the BIA has "reached out to the parties and we are supporting the tribe's efforts to reach a peaceful resolution," a spokesperson told the Associated Press. Lewis, who served as chairman, was apparently voted out of office last year. Reid says he will put an end to future disenrollments if he gains control of the tribe. The Great Spirit is in all things, he is in the air we breathe. The Confederated Tribes of the Colville Reservation and the state of Washington reached a settlement over hunting and jurisdiction. The tribe retains hunting and fishing rights on ceded land known as the North Half. Under the agreement, tribal members who are cited for violations of six hunting laws will appear in tribal court instead of state court. "We’re pleased that the state recognizes Colville Tribal member rights in the North Half, and that as a sovereign nation, we have the authority to enforce our laws here," Chairman Michael Finley said in a press release, The Wenatchee World reported. Whenever we walk on the Earth, we should pay attention to what is going on. Too often our minds are somewhere else, thinking about the past or thinking about the future. When we do this, we are missing important lessons. The Earth is a constant flow of lessons and learnings which also include a constant flow of positive feelings. If we are aware as we walk, we will gather words for our lives, the lessons to help our children; we will gather feelings of interconnectedness and calmness. When we experience this, we should say or think thoughts of gratitude. When we do this, the next person to walk on the sacred path will benefit even more. A judge in California won't put a stop to a road construction project that tribes say will destroy their burial grounds. Vista Superior Court Judge Harry Elias said San Diego County hasn't broken any laws by building the two-mile road. However, he urged the county to work with the San Luis Rey Band of Luiseño Indians and other tribes who oppose the development. "Now is the time and opportunity to truly sit down and talk to each other," Elias told the parties, The San Diego Union-Tribune reported. Ancestral remains and artifacts were found at the site last month. The Viejas Band Kumeyaay Indians donated $2,500 to help care for a dog that was found with gunshot wounds. The dog was found on the reservation on February 20. It had been shot in the chest. "This shooting goes against everything Viejas stands for and we will do everything we can to make sure Chance eventually gets to a home where he can know the safety, comfort and love that he deserves," Chairman Anthony R. Pico said in a statement, The San Diego Union-Tribune reported. Authorities are offering a $3,000 reward for information leading to an arrest and conviction in the shooting case. A mining bill that was opposed by the Bad River Band of Lake Superior Chippewa and other tribes in Wisconsin appears to be dead for now. Republicans pushed the bill, which would make it easier for Gogebic Taconite to build a $1.5 billion open pit iron ore mine next to the Bad River Reservation. But one lawmaker remained a holdout and said he couldn't support a measure that eliminates the ability for people to contest the project under state environmental laws. "My conscience simply won’t allow me to surrender the existing environmental protections without a full and open public debate," Sen. Dale Schultz (R) said at a press conference, the Associated Press reported. The legislative session ends in two weeks, leaving few chances for a compromise to be reached. At his press conference, Schultz noted that he met with tribal leaders and residents near the proposed mine who voiced concerns about it. The Bureau of Indian Affairs is moving forward with its consideration of the Spokane Tribe off-reservation casino project. The BIA released a draft environmental impact statement for the West Plains Mixed-Use Development. The project calls for a facility with about 98,000 square-feet of gaming space and a 300-room hotel. There's also plans for a parking structure, retail space, a commercial building, a cultural center and a police/fire station, according to a notice published in the Federal Register today. The tribe is seeking a two-part determination for the casino. In addition to BIA approval, the governor of Washington will have to agree to the project. The Mashantucket Pequot Tribal Nation of Connecticut has made final per capita payments to its members, The New London Day reports. At one point, each tribal member received upwards of $7,500 to $10,000 a month. But when the tribe's gaming revenues took a hit, the tribe decided to end the program. The tribe had been making "transitional" payments of decreasing value, the paper said. Those payments end today. Ricky Defoe, a member of the Fond du Lac Band of Lake Superior Chippewa, says he and other people will confront a "white pride" rally this Saturday in Duluth, Minnesota. Defoe, who serves as co-chair of the Duluth American Indian Commission, said he wants the voice of minority people to be heard. He will be joined by other minority leaders at the Duluth Civic Center Plaza, an hour before the Supreme White Alliance is expected to arrive there. The Indian commission hasn't taken a stance on the rally. Defoe said he is not acting on behalf of the commission. "'The President of the United States, by Henry Knox, Secretary for the Department of War, stipulates, in behalf of the United States, the following article, with the Five Nations of Indians, so called, being the Senecas, Oneidas, and the Stockbridge Indians, incorporated with them the Tuscaroras, Cayugas, and Onondagas, to wit: the United States, in order to promote the happiness of the Five Nations of Indians, will cause to be expended, annually, the amount of one thousand five hundred dollars, in purchasing for them clothing, domestic animals, and implements of husbandry, and for encouraging useful artificers to reside in their villages. Secretary for the Department of War. Done in the presence of Tobias Lear, Nathan Jones. "Now, know ye, That I, having seen and considered the said article, do accept, ratify, and confirm the same. "In testimony whereof, I have caused the seal of the United States to be hereunto affixed, and signed the same with my hand. "Given at the City of Philadelphia, the twenty-third day of April, in the year of our Lord one thousand seven hundred and ninety-two, and in the sixteenth year of the sovereignty and independence of the United States. Special prayers for our Elders for sharing their wisdom. Special prayers for David and Wanbli…the founders of Little Freddy and Massi Calling Corp. and all its members. We thank them for their time and dedication in helping the people. The lessons you have hidden in each leaf and each rock. the kettle to come about halfway up the mold. Cover the kettle and steam the mold for 3 hours. Remove the mold from the kettle and let stand 20 minutes. Remove the cover and let stand 10 minutes longer. Loosen the edges with spatula; invert onto plate. Let stand until bread unmolds. remark like that and I'll smash your face in!" Old Indian went up to the director and said, "Tomorrow rain." show up for two weeks. scene tomorrow," said the director, "and I'm depending on you. The Indian shrugged his shoulders. "Don't know," he said. They always ask at the doctor's reception why you are there, and you have to answer in front of others what's wrong and sometimes it is embarrassing. There's nothing worse than a Doctor's Receptionist who insists you tell her what is wrong with you, in a room full of other patients. I know most of us have experienced this, and I love the way this old guy handled it. 'There's something wrong with my dong', he replied. The Receptionist smiled smugly and asked, 'Yes??' There's something wrong with my ear,' he stated. Mess with seniors and you're going to loose. *****ALWAYS check with your doctor before trying anything new, even herbs. Adaptogens: Herbs that help us adapt to stress by supporting the adrenal glands, the endocrine system, and the whole person. ***Examples are ginseng root, nettle leaf, sarsaparilla, licorice root, and ashwagandha. Alterative: (Sanskrit: Parivartakas or Rakta Shodhana Karma ) These herbs alter or change a long-standing condition by aiding the elimination of metabolic toxins. Gradually facilitates a beneficial change in the body. Also known as "blood cleansers' in the past, these herbs improve lymphatic circulation, boost immunity, and help clear chronic conditions of the skin. These herbs also heal sores, boils, tumors, cancers; reduces fevers; detoxifies the liver, kills parasites and worms; helps in the treatment of infectious, contagious diseases and epidemics, flu, acne herpes, and venereal disease. ***Examples are: ginseng, aloe, sandalwood, red clover, burdock, bayberry, black pepper, cinnamon, myrrh, and safflower. Analgesic or anodynes: These herbs reduce or eliminate pain (e.g., digestive, circulatory, respiratory, nervous system, nerve, muscle, tooth pain, nervous digestion, headaches). Some herbs are strong pain relievers, often working best against pains of specific causes. ***Examples: Camphor, chamomile, cinnamon, cloves, echinacea, lavender flower, feverfew herb, cabbage leaves, wintergreen leaf , passionflower herb and flower. Anthelmintic (Sanskrit: Krumighana karma or krimighna) Herbs that destroys and dispels worms, parasites, fungus, yeast. ***Examples are: Pau d'arco, goldenseal, wormseed, wormwood, ajwan, cayenne, peppers, and pumpkin seeds. Anodyne: Herbs that relieve pain and reduces the sensitivity of the nerves. ***Examples: Ashok, barberry, cedar, and ginger. Antacid: Neutralizes the acid produced by the stomach. Helps the stomach lining recuperate to accommodate the healthy gastric acid needed for good digestion. ***Examples are: marshmallow root and leaf, meadowsweet herb, hops flower, and sweet flag. Antibiotic: Inhibits the growth of germs, bacteria, and harmful microbes. ***Examples are: Blackberry, comfrey, gentian, red raspberry, and yellow dock, black pepper, and ginger. Antiemetic: Prevents or alleviates nausea and vomiting. ***Examples are: Cloves, coriander, ginger, and raspberry. Antipyretic: (Sanskrit- Jwarahara) reduces fever by reducing production of heat at its centers; destroying fever toxins; sweating to increase the loss of heat; drawing out the heat (e.g., cold baths). ***Examples: Amalaki, black pepper, brihati, nirgundi, safflower, sandalwood. Antiseptic: prevents decay or putrefaction. A substance that inhibits the growth and development of microorganisms without necessarily destroying them. ***Examples are: Aloe, Chitrak, gokshura, gudmar, sandalwood, and turmeric. Antispasmodic: Relieves or prevents involuntary muscle spasm or cramps by strengthening nerves and the nervous system. ***Examples: Camomile, ashwagandha, basil, calamus, guggul, licorice, myrrh, sage, gotu kola, jatamanshi, peppermint, sandalwood, and spearmint. Aperient.- (Sanskrit- Bhedaniya) A mild or gentle laxative. Also called aperitive. ***Example: Rhubarb. Appetizer: For stimulating the appetite. Aromatic: Herb with a pleasant, fragrant scent and a pungent taste. ***Examples: Cardamom, cinnamon, cloves, fennel, peppermint, and turmeric. Astringent: Causes a local contraction of the skin, blood vessels, and other tissues, thereby arresting the discharge of blood, mucus, etc. Usually used locally as a topical application. ***Examples: Amalaki, arjuna, ashok, cinnamon, jasmine, sandalwood, and yarrow. Well, I guess that’s it til next month.